2 Weeks ago we shared our ideas with you on how to Lock in Gains; Smile Through Earnings using concepts of the RadioActive Trading Techniques. How do we Lock in Gains by adding to the cost basis? Did the put go to $0.00? Nope, we still have $3.85 of Extrinsic Value remaining on the JAN put, even though it is now over $6.00 points Out of the Money. Did we adjust the Put Strike? Yes! We now own a $60 strike put for 16-NOV expiration, still after the event, which means our at risk is only $0.03 heading into earnings! This adjustment to the GOOS RPM is Income Method #3 (with a #4 twist), The Bulletproof Vest, a great move heading into earnings. But we are not done yet. We locked in gains, but shouldn’t we reward ourselves with some premium? We generate -$1.25 of net credit for this position. Looks like a Bear Call spread, right? Why would I do a Bear Call spread heading into earnings? Because I own the stock this is simply a covered call (or collar) with an extra bought call that we received at a credit! 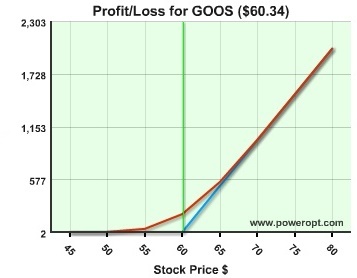 If GOOS collapses due to poor earnings, we still take a profit. We are guaranteed to get $60.00 back for the stock even if it drops to $50, $40 or even $30 per share or lower. But, if GOOS has no move, stays at $61.50 or so, we still take a profit. 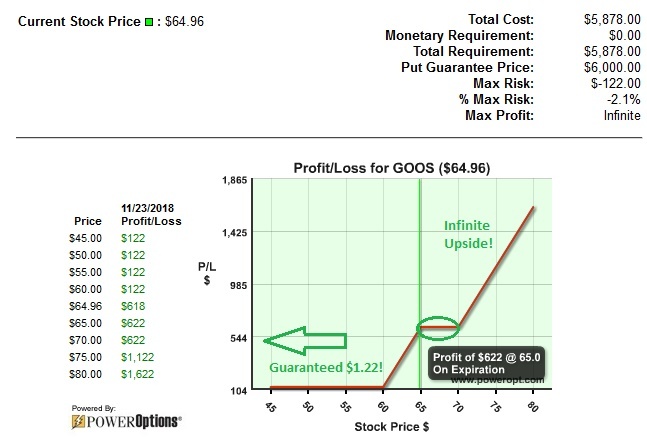 If GOOS jumps up above $65, we get assigned at $65, the 60 put and 70 call expire, a return of about 10%. And if GOOS gaps up above $70…the sky is the limit. Lock in Gains; Smile Through Earnings. At the Open after earnings on the 14th, GOOS gapped up to $72 then pulled back and closed right around $65. The market was weak that day, and I felt GOOS could continue up in the next 2 days to expiration. What’s the harm in leaving it open with unlimited upside? So, on Thursday, NOV 15th GOOS did move up and closed at $68.22. Better profit! And then on Friday, NOV 16th, GOOS continued up slightly and closed at $70.05. A little more profit. How Did the Numbers Work? 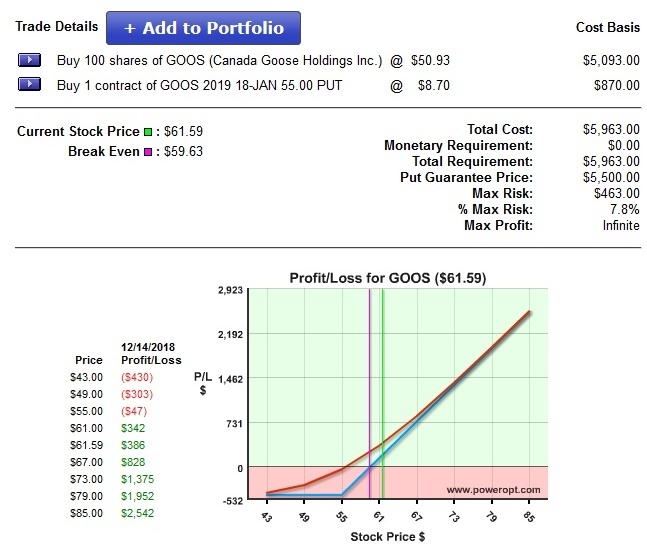 Well, our shares of GOOS were assigned at $65.00 due to the obligation of the short call. We Sold to Close the now just ITM 16-NOV 70 call for $0.08. And the 16-NOV Put expired worthless. And this was the return for the Fusion position. With No Risk heading into earnings and an unlimited upside if it really gapped up. We could have just adjusted the put, kept the risk at $0.03 heading into earnings and had unlimited upside. Then closed the stock on 16-NOV for about $70.00, a profit of $9.97 or about 16%. But, if the stock fell below $60.00 at earnings, we would have had a loss of -$0.03. But could have lost -7.8% if GOOS fell below $55 at earnings. I feel we made the right choice: Locked in Gains, took in some extra profit for reward, had no risk through earnings and took a 10.4% return with the Income Methods. Thanks to the Bulletproof Vest (IM #3) and a Riskless Spread Trade (IM #6). These plays, and the other 10 Income Methods (to generate premium without necessarily selling your stock) are detailed in RadioActivetrading’s premium product, The Blueprint. To get on the waiting list for the next release of The Blueprint, click here. You’ll also get a free mini-course teaching the basics of low-risk, high potential trading.